Our Mont Saint Michel Map will be your best guide on traveling to and around this awe-striking island city. 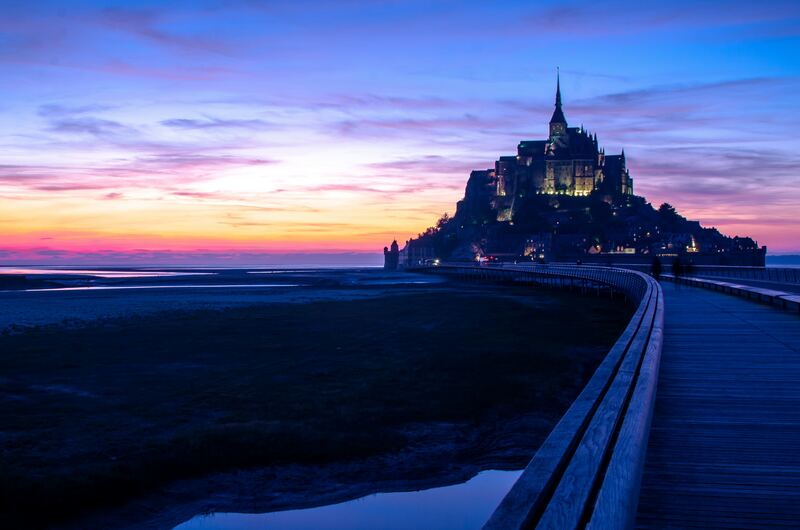 Mont Saint Michel’s Abbey is among the most culturally visited sites in all of France despite its remote location. Thousands of people take the long trip from Paris and other cities in Brittany and Normandy just to be able to see it for themselves. Our Mont Saint Michel Map doesn’t just guide you through inside the walls of the hilltop abbey, it will also show you what other interests there are in the surrounding bay. You’ll find our top recommendations for restaurants and hotels so you’re guaranteed a great time during the trip. And if you’re not planning on coming by car, don’t worry! 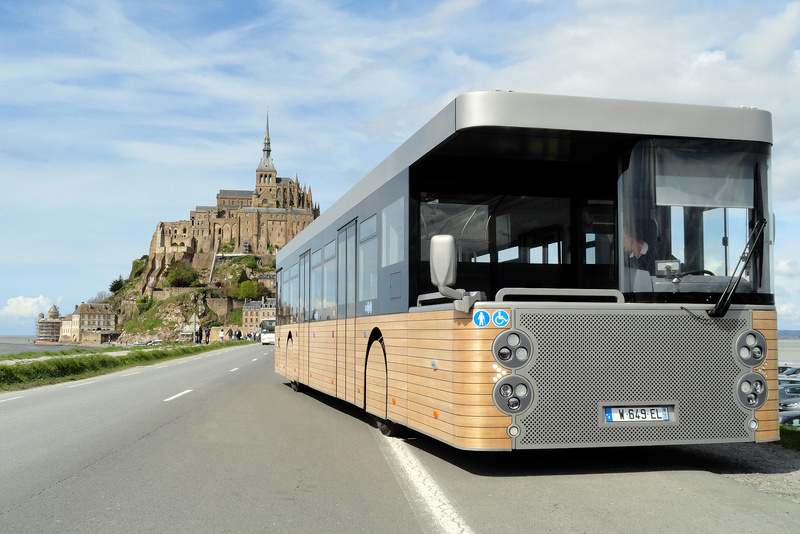 Our map will also show you the different ways you can get to Mont Saint Michel by public transportation! 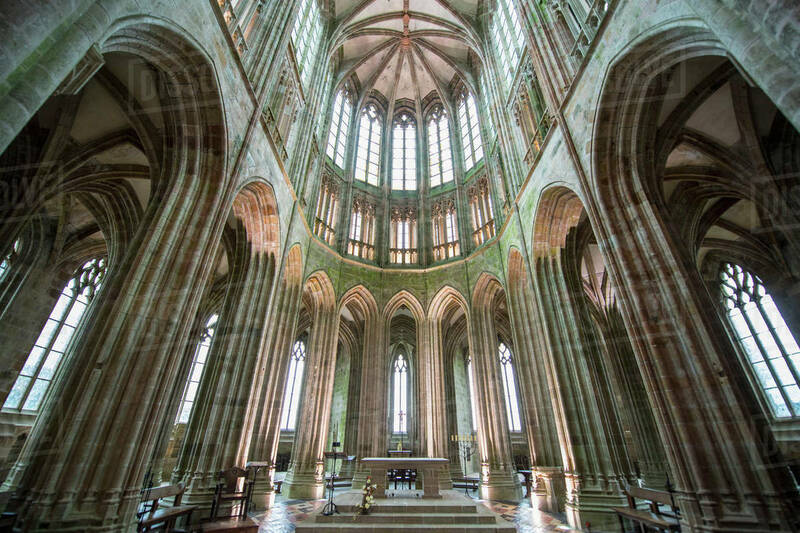 You’ll definitely want to visit Mont Saint Michel! What’s inside your Mont Saint Michel Map? From outside Mont Saint Michel, it will seem like there is only one attraction. But in fact, you’ll soon realize upon entry that there are a lot of things to see! Our Mont Saint Michel Map lists down the top 4 attractions in Mont Saint Michel that you must not miss while you’re there! You’ll be surprised to find that there are actually a lot of restaurants inside and outside the walled city of Mont Saint Michel. The restaurants you’ll find mostly serve traditional French food, popular brasserie fare, and of course, the ubiquitous fast-food for an easy cop-out. Our Mont Saint Michel Map aims to do better than just showing you what’s there. 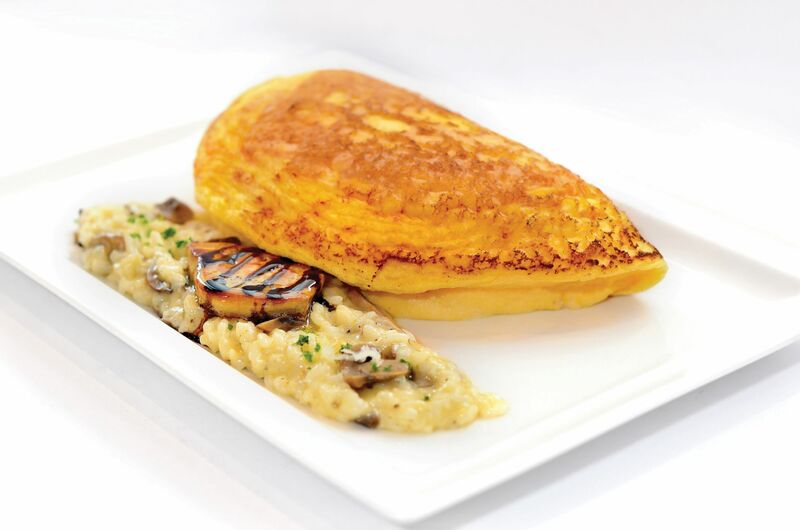 We’ve marked down our 3 favorite restaurants inside the city that are sure to match every traveller’s preferences. Getting to Mont Saint Michel from Paris by car is about a 4 hour drive and not many people are as eager to drive back. You’ll realize as soon as you step past the magnificent walls that you’ll want to complete the experience by staying overnight. Though there are a few options for where to stay inside Mont Saint Michel, we think that it is 10 times better to be staying around Mont Saint Michel Bay. That way, you have the absolute pleasure of enjoying the view of the abbey all lit up before you go to sleep. Another great thing is that it’ll be the first thing you see when you wake up. The abbey looks like it’s floating on air when it’s covered by fog! If you’ve made it all the way to Mont Saint Michel, make sure you don’t leave without a precious souvenir to remember your trip by. There are plenty of souvenir shops inside the walled city were you can buy delicious edibles like the famous butter cookies but we’ve got an even better suggestion for a souvenir that will last longer than an afternoon of snacking with tea or coffee. 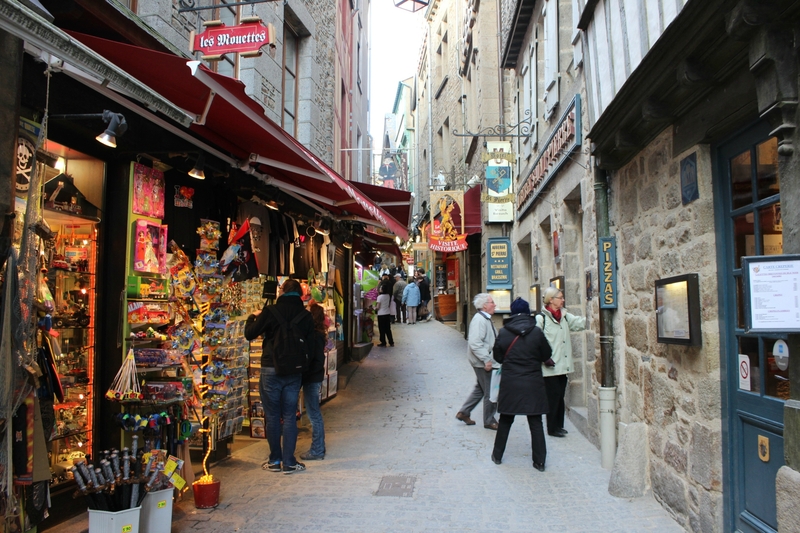 In our opinion, the best way to really enjoy a trip to Mont Saint Michel is by car. However, we also understand that this option is not always the most convenient one for some travellers. Our Mont Saint Michel Map includes useful info on traveling from different cities like Rennes and Caen. We also included a great recommendation for a guided full day tour from Paris! If you’re interested in excursions to Mont Saint Michel from cities like Bayeux and Caen, we tell you how to visit Mont Saint-Michel in detail here! Access to the online map version! We’ve also created an online version of this map so you can access it on-the-go. The online version easily opens on the Google Maps app. You’ll find descriptions of every attraction, restaurant, and recommendation we’ve included in the map. You’ll also find updated photos to help you get a better sense of your surroundings! Your access to the online version will be through the link on your PDF map download. 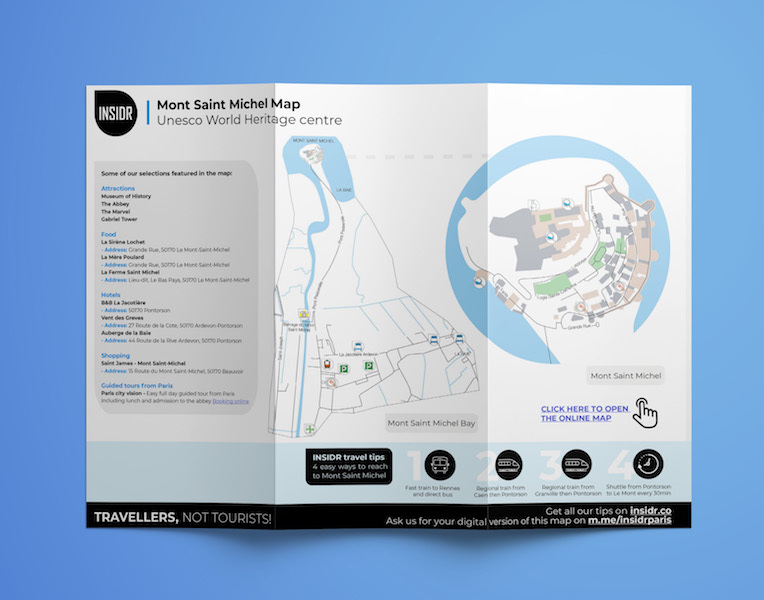 GET YOUR MONT SAINT MICHEL MAP NOW! If you’re traveling to Paris, make sure to optimize your visit, otherwise you’ll waste a lot of time. To do this, we’ve created a series of FREE Paris guides that you can download. These guides will make sure you see the best attractions, eat the best food, and travel around smoothly! You can also discover all our best Paris tips on our visit Paris travel guide.